In 1922, when Tillie Klimek’s husband, Joe, was sick in bed, she casually told him, again and again, that he wouldn’t live long. As he lay in bed, she sat beside him, sewing her own mourning dress. At one point, she even arrived at the house with a coffin, which she’d bought “at a bargain” for $30! When Joe was taken to the hospital, Tillie admitted to having put “white powder” on his food. He would eventually recover, but it turned out that Tillie had had at least three other husbands who had died mysteriously – not to mention that friends and relatives seemed to be in the habit of dying after eating at her house! When her second husband’s body was dug up, it was found to contain enough arsenic to kill four men. More was found in the body of her third husband, and more still in the body of the first! In the brief media storm that followed, several of Tillie’s friends and cousins were also arrested on suspicion of poisoning their husbands, and the papers began to refer to Tillie as “high priestess of the bluebeard clique.” It seemed that she had killed as many as 20 people – even a neighbor’s dog, about whose barking she had complained, was found dead of arsenic poisoning. The jury convicted her of the murder of her third husband and sentenced her to life in prison (where she died 13 years later) – how many others she and her cousin, Nellie Koulik (who was also convicted, but was released a year later when the conviction was overturned) may have killed may never be known, but police at the time suspected around 20. Despite such a high count and her tendency to be goofy (even in jail, her idea of a good joke was to trick Nellie into thinking she was going to be hanged), she’s mostly forgotten today (though some recent – mostly bad – TV segments have revived her somewhat). Those few articles that talk about her tend to stress the idea that she was a supposed “psychic” or fortune teller who went around predicting deaths with astonishing accuracy, but, other than telling her poisoned husband that he would die and planning for the funeral, there was no mention of that sort of thing in the Tribune at the time. The “psychic” angle was probably made up later by pulp writers, though it’s easy to see where they got the idea. She certainly did “predict” the deaths of the men she murdered after they got sick! A polish woman born (Otillie Gbrurek) who moved to America with her family at the age of one, Tillie Grubrek lived in the area known as “Little Poland.” Her last apartment, at 924 N Winchester (near Damen and Augusta) (left) still stands. On the corner is an old building with “Polonia Dairy Co” carved into the stone. Tillie would recognize much more of her neighborhood than most other historical Chicago killers would today. I barely knew anything about her before today, when Troy asked if I could find her address. I’m shocked at how similar she is to Johann Hoch, who killed several wives with arsenic. Like Tillie, he spoke with a thick accent (albeit a German one, wheras Tillie spoke in a thick Polish accent) and had the same sick sense of humor. He had been hanged before Tillie’s heyday, but what would have happened if these two ever met and married? It’s a screwball comedy waiting to happen! What I’d REALLY like to know is what happened to the coffin that Tillie bought for $30 and stored in the basement (with the landlady’s permission!). It is true that on Winchester about it does effected us to get into fight after visited at my descendant, Tillie Klimek's apartment. It has a bad influence on people, who visit that apartment. Really somethings ! Right you are! Just checked my "cheat sheet" of her various addresses – she lived in quite a few places around there, many of which are still standing. Just found out that Tillie Klimek did not lives on second floor! She was living on third floor ! Period ! 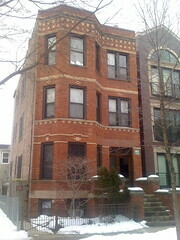 Tillie lived in several houses in that area – of the house pictures, I want to say it was the second floor offhand. Tillie Klimek was my part of family . Long line cousins! I need to know what floor she was living in??? Or was she owns a house??? Please reply and thank you ! Hi, Sharon! Can you email me at staff AT smartalecksguide.com ? I'd love to talk to you some more about this. Wow! I am a direct descendent of one of the victims, Frank Kupczyk-the correct spelling. He was married to my G.G Grandmother. He was a drunk and very abusive man. Pretty intersting to be able to Google all this now. I have never seen a picture of Frank until now, the newspaper picture. My Gramma looked just like him. The children were always so terrified of him. Anon – mostly from newspapers of the day around the time of the trial. Just about every story I've seen about Tillie since has been WAY off, mostly the result of pulp writers exaggerating the story. Googling the address is generally slightly off. I can assure you that that's 924 N Winchester; I took the photo myself. I'm doing a school project on serial killers and i chose Tillie, but when you google the adress it looks nothing like that house in the picture and a lot of info is different. I was wondering where you got your info? Great article you got here. It would be great to read a bit more about this topic. The only thing it would also be great to see on this blog is a few photos of any devices. Awesome…So, I just came across your website last night. Do you give tours or do you strictly write books? Wild! If I were Dr. Who, I'd think there was some kind of time rift below the house or something. We wondered if there might be some ghost stories about the house – it doesn't seem likely (even if we say, hypothetically, that ghosts are real), since I don't think anyone actually died there, but I've seen ghost stories generate around much less interesting stories! No…I think it's kind of funny. We've actually had a string of neighbors in the basement in bad relationships…lots of lovers quarrels. One man even pulled a sword on his girlfriend one night a couple years ago (nobody was hurt, thank goodness)…Maybe there's a little bad mojo in the garden apartment left behind from that coffin Tillie bought! Really, Kate? Hope we're not alarming you!